If you live in New Zealand then it is common in offices where a colleague brings once in a while a lot of fruits in the table for everyone to share, this is because most of the average homes here have their own fruit trees from peaches, apples, plums, lemons to pears. Several weeks ago my boss brought a box full of Nashi pears and one thing popped up in my mind, I will get a lot of them and make some Tarte Tatin. Tarte Tatin is an upside-down tart where fruits are caramelized in sugar and butter then baked in puff pastry, usually apples are used but pears, peaches, pineapples or any fruits can be used. This delicious dessert originated at the Hotel Tatin in Lamotte-Beuvron, France during the 1880’s by accident. It was said that Stéphanie Tatin one of the hotel owner created this tart when one day she was making some apple pies. Since she was so tired and overworked she forgot that she was preparing it hence it started to burn a bit and smell. To rescue the dish she tried putting pastry on top of the caramelized apples then baked them in the oven, when it was cooked she then turned it upside down and served it to her guests. It was a positive response and she was surprised that people enjoyed it, since then she started serving this version of apple pie and became the signature dish of the Hotel. Initially it was not called a tarte tatin and it was named by Louis Vaudable. History suggests that Louis Vaudable, the owner of Maxim’s restaurant once tried it and loved it, he then asked the kitchen how it was made but he never got the secret recipe. What he did is he applied as a gardener at the hotel. Three days after he got fired for not doing a good job but during those three days he got the secret recipe and sold it in his restaurant as “tarte des demoiselles Tatin”, the name tarte Tatin was then born. 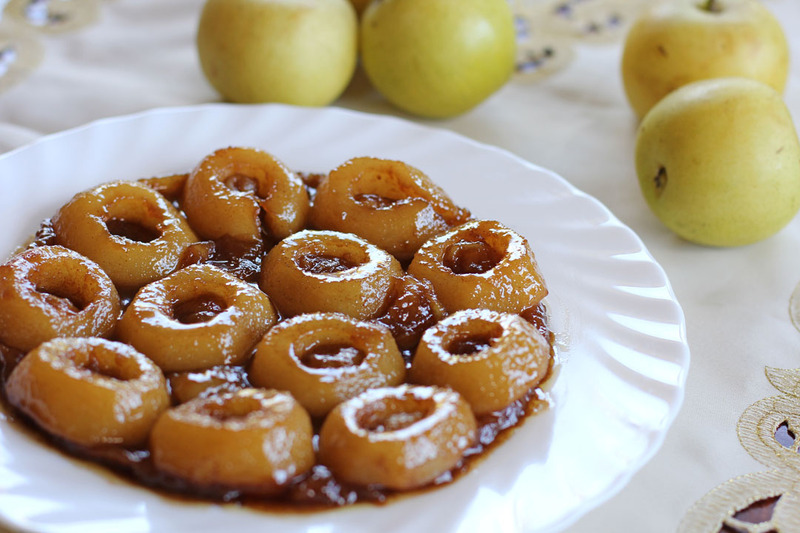 Well today it’s not a secret anymore as everyone enjoys this nice simple dessert, we will be using pears in this instance and here is my version. Cut pears in half, place in fridge and let it dry out for at least a day. It will turn brown, this is fine. You can also use the pears immediately but will contain extra liquid. Place butter, cinnamon and sugar in an 9 inch oven proof pan. Put in medium heat and caramelize the sugar, once melted add in the pears and cook for 10 minutes while occasionally turning to evenly coat the pears. Bring heat on high add the brandy and continue to cook for 2 minutes to further thicken and reduce the caramel. Turn heat off and let it cool for 10 minutes. Prepare your pastry by cutting it in a circle slightly larger than your pan, you can use any excess pastry to fill up the holes. Arrange your pears similar to the photo above then place the excess pastry on gaps and holes. Cover the top with the prepared round pastry and tuck the excess pastry inside. Place in a 200C preheated oven and bake for 15 minutes or until pastry turns golden brown. Let it cool for 10 minutes then invert it carefully onto a serving dish. I too always enjoy the history lesson! Lovely recipe! Raymund: This tarte tartin is looking GOOOOOD!!!!!! I so wish I could have it all for myself! I’ve never made a tarte tatin before, but I do sure love to eat them. This looks phenomenal. Love the brandy in it too! I’ve been wanting to make Julia Child’s tarte tatin, so thanks for the reminder! 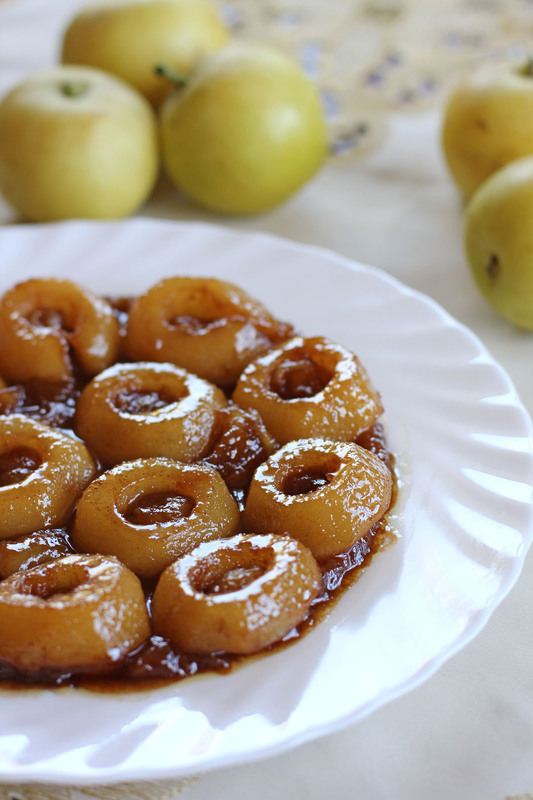 I’ve had apple tarte tatin, but never a pear one – wonderful idea. And pears are pretty plentiful in stores here at the moment, so the timing is right! Thanks for this. The only type dessert that I’ve had that is similar to the tarte tatin was what we call a pineapple upside down cake. I loved the caramelized pineapple but not too crazy about the “cake”. This looks so much better with the puff pastry! I could definitely go for this. Your tarte tatin looks and sounds so delicious!